How can I publish an Articulate Quizmaker quiz as an AICC course package that I can import into EKP? Articulate Quizmaker is capable of publishing quizzes as both SCORM and AICC content. EKP can import and deliver both formats. One advantage of publishing as AICC content is that learners do not have to have Java installed in order to take the quizzes. However, there are a few points to bear in mind when publishing Quizmaker quizzes as AICC content. By following the steps below, you can publish a quiz as an AICC course package and import the package into EKP. Click the Publish button in the Quizmaker toolbar. 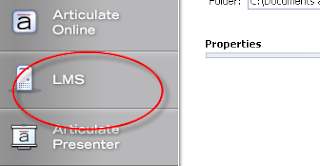 In the Publish window, choose LMS from the left menu. In the LMS field under Output Options, select AICC. Under LMS Course Information in the LMS Metadata window, complete the Description and Creator fields. Note that if you leave these fields blank, Quizmaker will omit these fields from the published AICC files, resulting in files that are invalid according to the AICC specification. Therefore, in order to produce a valid AICC course package, you must complete these fields before publishing the quiz. The default value of the Filename(URL) field is http://www.servername.com/quiz/index_lms.html. While it's possible to replace this with the full URL at which the quiz will be published, it's easier to simply remove the initial portion so that the value becomes just index_lms.html. (Note that the value should not contain any slash characters.) If you then import the quiz into EKP as an AICC course package as described below, EKP can automatically deduce the full URL needed to launch the quiz. Click the OK button to dismiss the LMS Metadata window. In the Publish window, under Output Options, ensure that the check box labeled Zip files is checked. The resulting zip file can be imported into EKP using the Import Content Package function (Manage > Catalog Manager > Import Content Package)—simply follow the on-screen instructions. In summary, the important points are as listed below. Be sure to complete the Description and Creator fields in the LMS Course Information section of the LMS Metadata window. Enter index_lms.html in the Filename(URL) field. Under Output Options in the Publish window, ensure that the check box labeled Zip files is checked. Import the published zip file into EKP using the Import Content Package function.